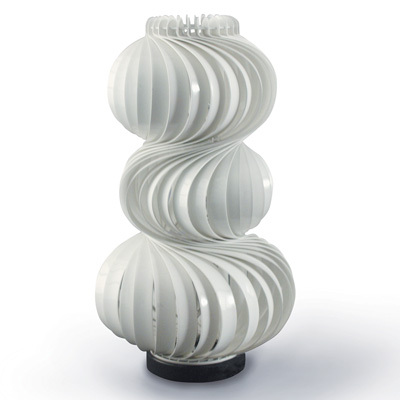 This stunning lamp was designed in 1968 by Austrian born Olaf von Bohr for Valenti in Italy. Probably the most beautiful lamp that was ever designed. Made by assembling around a steel circle a number of bent and painted steel foils to form a particularly soft light diffuser. Sinuous and appealing, it combines the principles of a clear and minimal design with the timeless force of dreams and poetry. This light can be seen in the Permanent Exhibition of Italian Design at the Milan Triennial and in leading design centres. Incredible center piece in any room.